Photo: Ivy Green, ca. 1820, 300 West North Commons, Tuscumbia, AL. Birthplace and childhood home of Helen Keller. Listed on the National Register of Historic Places in 1970. Photographed by User:Jennifer Lee (own work), 2009, [cc-by-2.0 (creativecommons.org/licenses/by/2.0)], via Wikimedia Commons, accessed July, 2016. 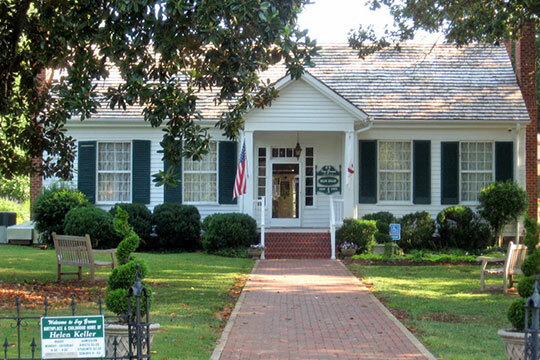 Colbert County administrative offices are located at 201 North Main Street, Tuscumbia, AL 35674; phone: 256-386-8500. First settled around 1819 at Leighton (then known as Jeffrey's Crossroads). Colbert County was created in 1867 from part of Franklin County. Tuscumbia was designated as the county seat in 1870.